It is quite difficult to choose the top five among so many thrilling adventure water sports in the Andaman and Nicobar Islands. Among the ones that tops the chart are swimming, speed boat rides, snorkelling, sea cruises, scuba diving, banana boat rides, dolphin watching, parasailing, sea underwater walking, jet skiing, night kayaking and swimming with the elephants. Each of these water sports is bound to thrill you and make you fall in love with the blue Andaman seas. 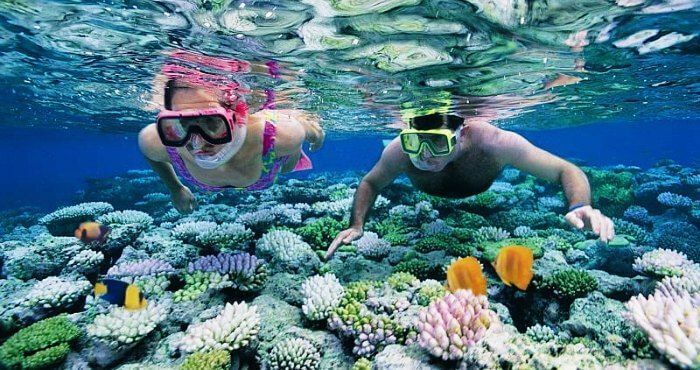 Snorkelling is another water sport like scuba diving that does not require that you know swimming. Andamans provide excellent snorkelling experience under expert guides. The warm waters of the coral reef and the rich and vibrant underwater world will offer you a unique memory. You can view the rarest of rare corals and the indigo sea clams and molluscs, and the spritely colourful fishes big and small swimming around you. It is a deep sea fantasy world brought alive. The waters around Havelock are clearer and richer in sea flora and fauna compared to North Bay. There would still be some who would be cautious and reluctant to dive into the underwater for a snorkelling, scuba diving or sea walking spree. For those not-so-brave-hearts, the glass bottom boat ride option is an opportunity to watch the deep blue underwater life from the comfort of your seat safely perched in a dry glass bottom boat. 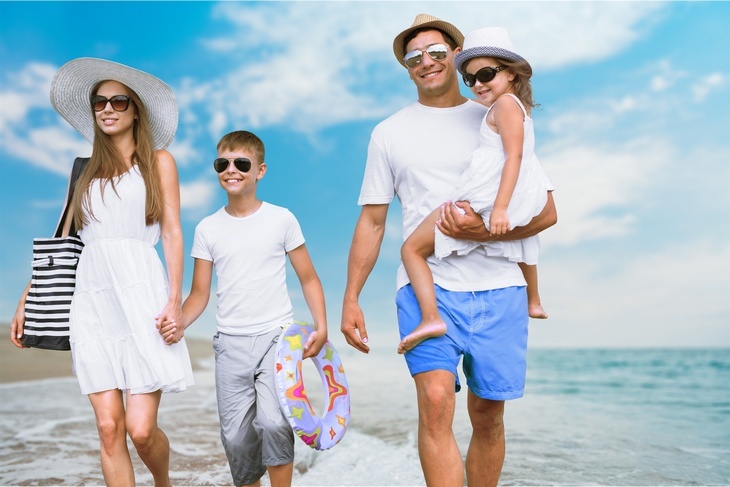 The whole family, including kids and elderly people can have a delightful peep at the corals and the marine life underwater. Some of the places offering rides are Water Sports Complex in Port Blair, off the coast of North Bay Coral Island, Neil Island and Havelock Island. Riding a Banana Boat in a close group of family or friends can be simply joyous and thrilling. A maximum of six people can perch on a banana boat. As the banana boat is pulled along by a speed boat bobbing up and down tied to it, you clench your teeth and balance your body to retain balance. Life jackets make your fun trip absolutely safe. An over-enthusiastic speed boat driver will always go overboard and swerve a bend precariously to unbalance the banana boat riders and splash you will go into the salty waters. This adds to the thrill. Charges are INR 620 onwards per person, which includes the boat ride, life jacket and instructor presence. 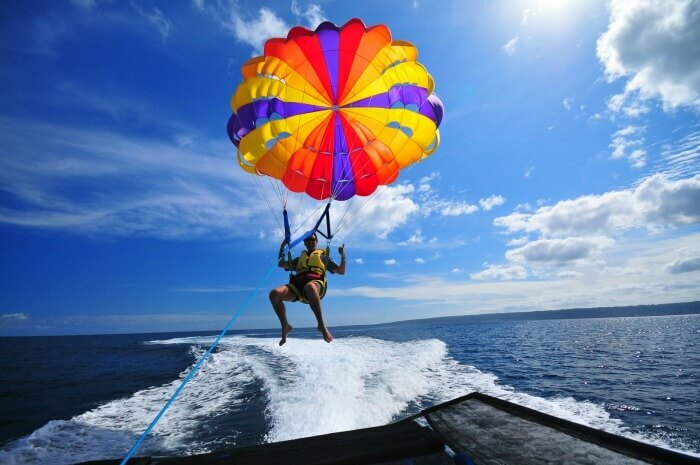 Parasailing gives you the ultimate thrill of flying high up into the air over the blue blue seas and the feeling the rush of winds against you as you parasail in a parachute harnessed to a speedboat blowing you past the waters. You would be blown around like a kite and it is extremely thrilling to experience the air and sea together with the speed. Dolphin watch is fascinating as you keep on scouring the quite blue seas waters for a sudden ecstatic moment when a dolphin with rush up and reach the surface to breathe and then vanish into the waters. The two most famous dolphin watching sites of Andaman and Nicobar Islands are the Long Island and Jolly Buoy Island.